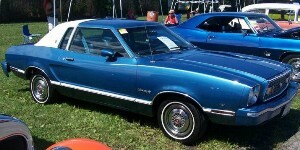 The 1976 Mustang Ghia optioned coupe included a half vinyl roof, hood striping, bodyside moldings, velour cloth interior color-keyed sun visors and headliner, and center console. The Ghia Luxury Group was offered between 1974 to 1981. In 1976 the Ghia package added $334 to the standard notchback coupe (or two-door sedan). Ghia was a group of Italian designers which Ford acquired a controlling interest in 1970. Bright Blue 1976 Mustang II with Ghia Luxury Group (half vinyl roof, hood striping, bodyside moldings, velour cloth interior color-keyed sun visors and headliner, and center console) and a 112hp (302ci, 5.0 liter, V8) under the hood. The Ghia Luxury Group was extensive enough in 1974 to 1981 that it became the fourth model number (04 for 1976) selling for $334 more than the standard notchback coupe (or two-door sedan). Ghia was a group of Italian designers which Ford acquired a controlling interest in 1970 who designed the Mustang II models which started in 1974. Check out the factory red vinyl top on this 1976 Mustang II Ghia notchback. It has a red interior as well. Under the hood is a 4-cylinder engine connected to an automatic transmission. This Silver Blue Glow 1976 Mustang II Ghia coupe is in pretty good condition for its age. It has the Ghia luxury options package which includes bumper guards, body side color matched molding, pin striping, a silver blue half vinyl roof, fog lamps, and a luxury interior. This car also has the mid-sized 104hp (at 4000rpm), 170 cubic inch (2.8 liter), 2 barrel, 6 cylinder engine. Dark Yellow Green 1976 Mustang II hardtop with Ghia luxury group options. Some of these exterior options include green vinyl half top, color keyed sport mirrors, fog lamps, wire wheel covers, and body side molding. Cream 1976 luxury sport optioned Ghia Mustang coupe with Westminster cloth in Cream (Code DV), Black, Bright Red, Blue and Tan was also available as interiors. Standard options include half vinyl roof, deluxe wheel covers, color matched bodyside molding, dual accent paint stripes, standard chrome grille with fog lamps, and luxury interior. This Ghia Mustang has the following options: center console, dual remote mirrors, select shift automatic transmission, and wide band tires. This photo is from the cover of the 1976 Ford Mustang promotional catalog. The 1976 Mustang MPG package of the 93hp 2.3L 4-cylinder also came in the luxury sport optioned Ghia coupe. The Ghia came standard with half vinyl roof, pin stripes, body side moldings, color-keyed mirrors, and luxury interior. This car has been upgraded with wire wheels and bumper guards. This photo is also in the 1976 Ford Mustang promotional catalog. Dark Red 1976 Mustang II coupe with Ghia luxury package which included half vinyl roof, body side color keyed side moldings, color keyed sport mirrors, fog lamps, and a luxury interior. Check out this photo of a Polar White 1976 Mustang II Ghia notchback. It's a HDR photo. This Mustang II has a white half vinyl top, blue interior, automatic, and the 2.8L V6 engine.